"There was a code. He made me enter it." 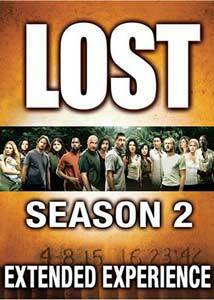 Lost is ABC's plane-crash-on-a-mysterious-island megahit from J.J. Abrams that actually gave me a whole dose of renewed hope that network television could hit back with something original, compelling and unpredictable�and still be wildly popular at the same time. The first season jumped out from all directions, introducing an uncompromisingly large ensemble cast that we learned about in dribs and drabs via flashbacks�as well as how these backstories proved to be deeply interconnected somehow�after they were dropped onto a bizarrely lush island location in the middle of nowhere that seems far from uninhabited. And when Season One came to a close, it was with a final episode that spewed out a couple of pull-out-your-hair cliffhangers that made waiting for some hoped-for conflict resolution a tough one to endure, and visions of where The X-Files went�a series that seemed to forget how to actually answer questions�stagger in the background like a drunken uncle. That resolution does come in rather quickly in Season Two in the first two episodes, but the pleasure in the carrot-on-a-stick way the plot points are explained is that for every answer, there are seemingly three new questions raised. To further complicate the viewing process during its original run, viewers had to bear with ABC's sometimes questionable momentum-killing scheduling concerns that made "is there a new Lost on this week?" a sort of collective mantra. The good news on that front is that this seven-disc set alleviates the need for that wait, and for those already in the know this can act as a handy refresher course, utilized to revisit and study the clues or just wallow in the twisty labyrinth of the Hanso Foundation-inspired strangeness inflicted upon the unlucky survivors of Oceanic flight 815. But let's say you're something of a latecomer to the party, and now that you've presumably caught yourself up via the season one set you are chomping at the bit, ready to make up for "lost" time before the start of Season Three. It is time to enter the storytelling heft that is Season Two, and flop around in all of the answers inside to even more questions, and enjoy. And, for the record, I will attempt to keep this review pretty much spoiler-free, so as not to diminish the joy of discovery for you. Didn't see the premier season ? Well, you're in the wrong classroom, pal. My advice, sit down with Season One BEFORE you even think of peeking under the hood here, because your head will just end up hurting unnecessarily. This sophomore season hits the ground hard right away, to the strains of Mama Cass' Make Your Own Kind of Music in the kickoff Man of Science, Man of Faith, in what for my money is one of television's finest three minutes. Ever. And then the answers start coming�oh yes, they do come�but then again so do other more profound questions, written with a give-and-take pace that keeps up for the duration of the 22 episodes, and there is indeed a whole lot going on, with a ton of characters to share the load. The enigmatic Locke (Terry O'Quinn) eventually becomes the yin to the yang of new Lostie Mr. Eko (Adewale Akinnuoye-Agbaje), another richly drawn character with a very different take on matters of faith and destiny, while leader-by-proxy Dr. Jack Shephard (Matthew Fox) struggles with leftover daddy issues, in addition to keeping a logical-minded rein on the survivors, all the while trying to keep the group alive against whoever and/or whatever lurks in the jungle. This is made all the more confusing by Jack's haven't-we-met-before relationship to Desmond (Henry Ian Cusick), yet another island dweller who promises to be a pivotal player come the third season. Then there is über hot escaped felon Kate (Evangeline Lilly), balancing feelings between our good guy doctor and sassy bad boy con man Sawyer (Josh Holloway) as we are given more insight and clarity into their complex pasts in What Kate Did and the standout The Long Con, respectively. And let's not forget another certifiable force that rises up during this sophomore season in the form of another new cast member, the gruff-as-gruff-can-be Ana-Lucia (Michelle Rodriguez), possibly one of the most message-board reviled characters in the annals of network television. But to the credit of Rodriguez, the role of Ana-Lucia drips with the proper kind of ugly, and I found myself in the minority of those who appreciated�for the right reasons�her sweaty, gun-toting sneer and bravado, considering the brutal events of what transpired in the backstory of her band of survivors in The Other 48 Days. That's just a mere scratch of the many-faceted surface, where the dead can and do live again in the assorted key character flashbacks�tossed in between the heroin jonesing of rock star Charlie (Dominic Monaghan), the force of a recurring numerical sequence on comic relief Hurley (Jorge Garcia), the fate of shanghaied kid-with-something-extra Walt (Malcolm David Kelley), the strange relationship between Jin (Daniel Dae Kim) and Sun (Yunjin Kim) or kind-eyed but vengeful Iraqi soldier Sayid (Naveen Andrews) who finds a doomed romance and a brief return to his torturer's skillset. All of these elements merge together, folding in on one another until all of the overlapping parts hint at a larger, more ominous picture, cemented in the third episode, The Orientation, where a certain badly spliced film spills the vague beans on the black cloud that is the Dharma Initiative. Once the arrival of Henry Gale (Michael Emerson) occurs, dangling�literally�in the net of crazy island Frenchwoman Rousseau (Mira Furlan), does the crux of the final block of episodes reach wonderfully complex depths. Not to use those addictive message boards as a barometer, but there is a prickly concern that the writers are indeed pulling an X-Files, haplessly stringing viewers along, building mysteries and connections that even they don't know or understand the answers to. This would be a fundamental red flag and something of a death knell, despite the oft-stated promise that a clearly defined storyline has been outlined for at least the first few seasons, I have to have faith. Locke and Eko would have it no other way. Image Transfer Review: All 22 episodes are presented in 1.78:1 anamorphic widescreen�nothing new if you watched the HD broadcasts, but an excellent step up for the rest of us mopes. These are high quality transfers, marred by some brief sporadic grain, but otherwise chock full of strong and vibrant colors and sharp levels of detail. Compression issues and/or artifacting are not an issue in the slightest, so the short answer is that this Season Two set actually looks light years better than it did during its already nice-looking standard non-HD broadcast. Audio Transfer Review: Two audio choices, both in English, available in either Dolby Digital 5.1 or 2.0 surround. To be honest, the 2.0 would have been a suitable mix on its own, because it works solidly and effectively, offering up some deep bass amidst clear, distinct voice quality. But the 5.1 track is really the way to go, because it is just as deep, and it dramatically widens the experience, pushing discrete cues around all channels as the aggressive presentation incorporates a very immersive soundstage. Extras Review: Packaging on this large seven-disc set is a four-fold case with a plastic slipcover. Inside, each disc has its own unique label art, as well as completely different full-motion menu designs. Disc 7, where all of the non-commentary extras are housed, is structured like a Dharma orientation film, and features an intentionally choppily spliced set of instructions. An insert booklet carries pleasantly vague episode descriptions, and sports a few a small photos, too. There are five commentary tracks, beginning with the best of the batch for Man of Science, Man of Faith, with input from executive producers Damon Lindelof, Carlton Cuse, Bryan Burk, and Jack Bender. Even though their speaking voices are very similar, the content is excellent, spanning the derivation of the choice of the Mama Cass song to fundamental decisions in things like hatch design, sound and score elements. What Kate Did features director Paul Edwards, director of photography Michael Bonvillain, and actress Evangeline Lilly (Kate), the latter of whom openly admires the well-cut chest of Daniel Dae Kim (Jin). This track has a lot of in-joke chuckling, and isn't nearly as vital as the first commentary, in terms of overall revelations. The 23rd Psalm once again has Damon Lindelof, Carlton Cuse, and Bryan Burk, and as with their presence on the first episode of the season, gives this track runner-up status as second best of the five. Less captivating but easy to listen to is the track on The Whole Truth, with cast members Yunjin Kim (Sun) and Daniel Dae Kim (Jin), as well as writers Elizabeth Sarnoff and Christina Kim, joking about plot points like island pregnancy kits and on-set gags during the ep's big romantic scene between Sun and Jin. Dave unites director Jack Bender with cast members Jorge Garcia (Hurley) and Cynthia Watros (Libby), where we are privy to such critical trivia as the source of Hurley's sweat. Things begin with Fire + Water: Anatomy of an Episode (31m:45s), an in-depth look at all angles of the creative process, from hatching Charlie's motivation to set design, locations and costumes. Lost: On Location (44m:44s) is viewable either as one long segment, or ten separate ones, with each individual piece a particular collection of behind-the-scenes looks at a given episode. The eps featured are Adrift (yes, that was a Dharma shark logo), Everybody Hates Hugo, Abandoned, Collision, The 23rd Psalm, The Whole Truth, Dave, S.O.S., Two for the Road, and Live Together, Die Alone. On a lighter note is The World According to Sawyer (04m:31s), a quick look at nearly all of the goofy names Josh Holloway's character calls everyone else. The middle section houses The Lost Flashbacks, a nonanamorphic widescreen set of three unused flashbacks, two Shannon-centric clips from Abandon and a Locke-centric piece from, appropriately enough, Lockdown. All three run less than four minutes in total. There are 14 rather mundane (i.e. no big secrets withheld) deleted scenes (19m:16s), also in nonanamorphic widescreen, and a wacky Lost Bloopers (04m:06s) reel is filled with the expected line flubs and crack ups. The highly stylized Channel 4 UK Promo Directed By Dave Lachappelle (01m:06s) is presented in anamorphic widescreen, and it is a beautifully odd teaser, using the show's characters in a tableau of slow-motion dance on the beach, in front of the remnants of the burning wreckage of Oceanic Flight 815. A quick batch of television-related trailers concludes this section. Lost Connections (01m:56s) begins with an explanation of the theory of centrality, better known as six degrees of separation, which of course is one of Lost's building blocks of storytelling. After the intro, there is a rather complicated interactive interface that allows users to navigate back-and-forth between the myriad of sometimes blink-and-you-miss-it character relationships that crop up. There are video clips here to reinforce a given link, and while the concept is sound, the navigation is little cumbersome. Mysteries, Theories and Conspiracies (10m:17s) talks up what one writer refers as the "thick and complicated mythology" of the show, even giving props to The Fuselage fan site. Secrets from the Hatch (15m:47s) looks at creating and assembling the island's underground mystery centerpiece. There are also at least five easter eggs scattered hither and yon, none terribly difficult to locate. Some are rather pointless (wet Walt), some reiterate facts gleaned from a given commentary (Hurley's sweat), while another looks up-close at the behind-the-scenes creation of those tasty-looking Dharma Initiative cookies. Finally, a television series I watch regularly that has not been prematurely canceled (at least as of yet). This whopper of a Season Two set carries a high-grade 5.1 audio and anamorphic widescreen transfers, certainly besting the standard non-HD broadcast quality, making the rewatching and searching for clues very satisfying. Plus, there's an entire disc full of above-par supplements. And if the presentation and/or packaging weren't enough, you have the furiously rich episodes themselves, which unfold with a multi-layered, serpentine interconnectivity that begins with a bang and ends with an even bigger bang. The adage of "for every question answered, three questions raised" applies here in excess, and the journey itself is well worth the time.